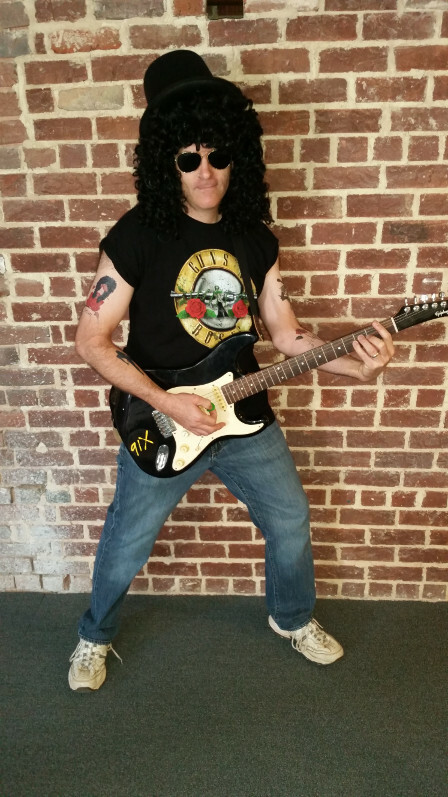 For Halloween this year my costume was of my alter-ego: Slash, the Guns N’ Roses guitarist who has a very distinctive look. I ordered the various pieces about a month ago, including temporary tattoos, and was ready to go on Halloween morning, confident that mine would be one of the top costumes at my office. Only no one else wore costumes. No one! Halloween fell on a Tuesday this year, a day when many of my officemates work from home. It was kinda sad that the office missed a chance to do a proper Halloween day but in all fairness we had had a chili contest the day before, so that was something. It wasn’t all for naught for me, though. 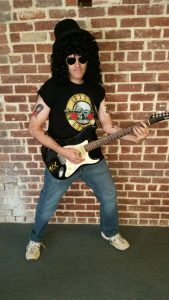 I brought my electric guitar into the office as part of my costume (though it is a cheap Epiphone and not Slash’s preferred Les Paul). Though my guitar isn’t the best, once I got it somewhat tuned up I reminded myself how much fun it is to just pick up a guitar and noodle around with it during the workday. Several times a day yesterday I would grab my guitar and practice bar chords and other stuff, walking over to a nearby conference room to avoid disturbing my officemates. Tl;dr I won the costume contest by default and I also reignited my love for playing guitar. Not a bad day.